Open-Source democracy, a radical form of government in which citizens share responsibility for the state of their union, will it destroy everything? 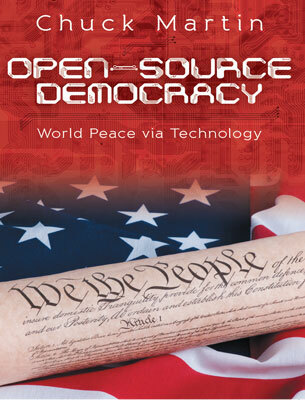 Explicit Open-Source democracy, a radical form of government in which citizens share responsibility for the state of their union, helps a Native American software engineer named Bernice become the next president of the United States. Bringing a renewed sense of confidence and empowerment to the downtrodden masses of the Information Age, opensource democracy allows everyday people the opportunity to shape the world they live in. And most couldn’t be happier . . . But not everyone is convinced. The powers that be are nostalgic for a society in which guile, intrigue, and deceit are used in the pursuit of money—and they are willing to kill to bring that society back. As the stakes are raised to include nothing less than the fate of humanity, the ideals of the new world order are put to the ultimate test. Is the dream of peace on Earth truly possible? Or will explicit democracy destroy everything? Chuck Martin is a software developer with engineering degrees from Ohio State and UCLA. For the last thirty-five years, he has worked for technology companies in Southern California, including Hughes Aircraft, McDonnell Douglas, Litton, Delco, Rockwell, and Panasonic. He and his wife, Nancy, along with their son, John, enjoy nature, zoos, reading, and the outdoors. He experienced the open-source software revolution firsthand and like many, was at first befuddled how free products could consistently be higher in quality than those of private, for-profit competitors. When he began to understand the application of this development technology to address the ills and dysfunctions of not only our own democracy but governments the world over (i.e. to diminish the levers of influence that cause inefficiencies and unfair disparities), he became enamored with the book’s plot and now lives for the day that a trial run might be made.